Daniel Iliyn. Courtesy David Evans & Associates. Some people walk through years on a particular career path before discovering their true passion. And some bypass identity crises because they’re hardwired from the beginning to follow their true calling. For whatever lucky reason, it’s in their DNA. That’s certainly the case with Daniel Iliyn, PE, a civil engineer of roads and highways for David Evans and Associates, Inc. (DEA) in Portland, Oregon. Telltale signs of an engineer-in-the-making were present from his toddler years. Skip ahead to 2010, and Iliyn had graduated from Oregon State University with a BS in civil engineering and joined the team at DEA. Although he just earned his professional-engineering license last year, he’s been doing major plan-and-design work since he started, including a multibillion-dollar light-rail project and a five-mile roadway extension project through an active rock quarry. Here, he reveals what the real life of a civil engineer is about, from the creative challenges and difficult conversations with the public to the thrilling first ride on the rail—past surrounding roads he designed—with his 3-year-old son. Why did you pursue a career in civil engineering? When I was younger, my passion was in numbers and in puzzles. My mom told me that when I was 2 years old, I was doing 100-piece puzzles on my own. Literally, from the time I could pick up puzzle pieces, I loved to put things together. To me, civil engineering is just a giant puzzle, especially when you’re talking about transportation and trying to fit a pedestrian and bike path through an existing corridor that may not have the space and trying to maneuver around existing lanes and features to try to get things to work. 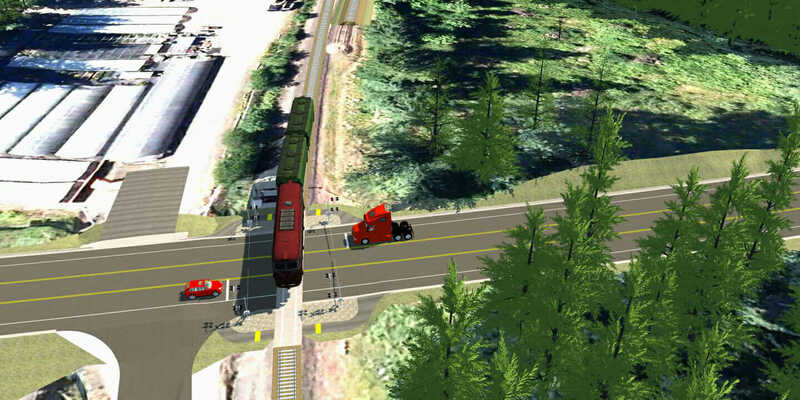 Visualization shot from the InfraWorks model of the 124th Avenue Extension Project between Tualatin and Sherwood in Oregon. Courtesy David Evans & Associates. How is creativity part of your job? Creativity comes into play when you’re dealing with a number of constraints within a 3D world. 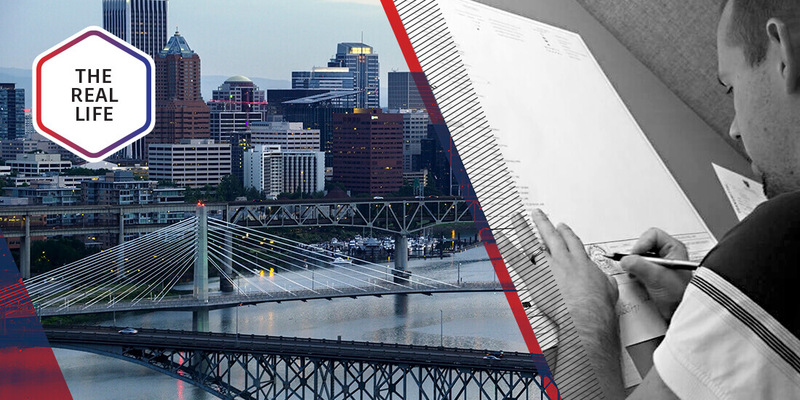 As a transportation engineer, one of the biggest trials we run into is juggling the desires of our clients, as well as the public, while still providing a safe, efficient, cost-effective design that meets set jurisdictional design standards. There are a variety of external inputs we have to take into account when we’re designing a road, such as the design standards for how steep or wide that road can be, how many lanes it needs, and what type of vehicles it needs to accommodate. At the same time, there are external factors such as environmental impacts—like you can’t touch this wetland or a certain portion of trees because it’s within a riparian buffer zone or some other environmentally designated area. Or you can’t touch this building or corner of this street because it’s a historical artifact. So when you bring all these different pieces in, it takes a whole lot of thought and creativity to get what the client may want. And then we’re moving toward utilizing 3D-visualization design in coordination with BIM [using Autodesk InfraWorks 360]—spinning out visualizations, images, and videos—in the early stages of projects to help nonengineer types, including our clients and the public, understand our design goal or vision for a project. We deal extensively with the public because we’re building brand-new roads right through their backyards or expanding roads in front of their houses or businesses. The public is very interested in the projects we’re working on, so we do public meetings and open houses where people are allowed see the design as it’s progressing. 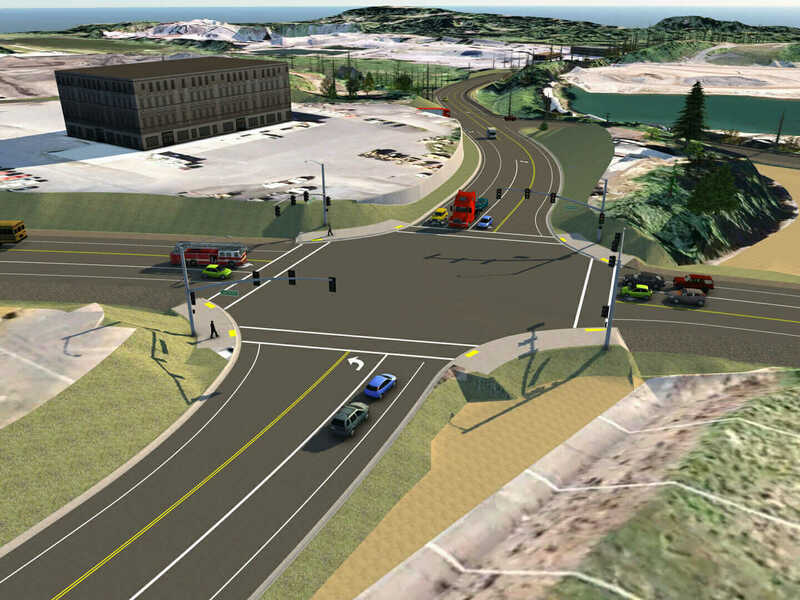 “Using InfraWorks is so much fun,” Daniel Iliyn says. “I feel like I’m getting paid to play SimCity.” InfraWorks visualization shot of 124th Avenue Extension project courtesy David Evans & Associates. How do you ease the fears and frustrations of the public? When we go to open houses with the client, we have to be careful about explaining why this needs to be done and why its impacts are as large as they are. Those meetings can be one of the most stressful moments when you’re dealing with nonengineer types who don’t understand the design standards and ask questions like, “Why does the slope on that road need to be so wide and cut into my property?” As the designer, I have to do my best to present the design intent of the project in a way the public can understand, which can be difficult at times. What do you dread doing in your job? One thing that can drive me crazy as a consultant is juggling difficult client and public demands. I’ve had times when we were told by the client to design something a certain way that I didn’t necessarily agree with. I felt there could’ve been a more efficient way, and in those cases, you have to weigh how hard you want to push back against the client. For example, there was a portion of a roadway project where we were tying it into a small portion or existing sidewalk the client wanted to maintain. I thought it was pointless and a waste of effort on the design side to save a piece of sidewalk when we were putting in all new sidewalk around it. We probably spent more time on the design side than it would’ve been costwise to just replace that sidewalk. Also, design in the civil world is an iterative process, and it can be frustrating when you’re on your fifth time designing a portion of a road. On one hand, it drives me nuts, but on the other, once you come to a solution, it’s that feeling of putting the last puzzle piece in the puzzle. 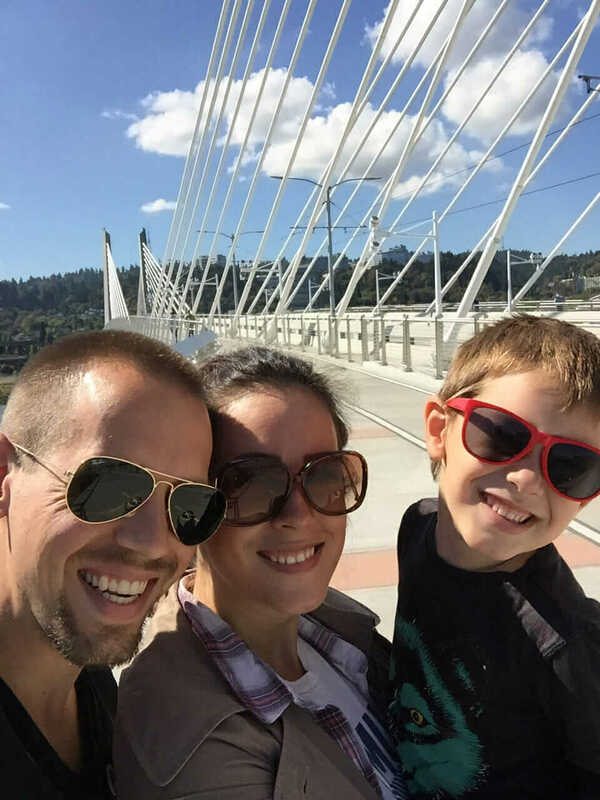 Daniel Iliyn, his wife Bonnie, and son Josiah on the Tilikum Crossing bridge, part of the “Portland to Milwaukie [Oregon] Light Rail” project. Courtesy Daniel Iliyn. What’s the most rewarding project you’ve worked on? The project that was probably the most rewarding was an 8-mile-long light-rail corridor that included a brand-new bridge over the river here in Portland. It was the first project I got put on right out of college. I was scheduled to provide support on the project for no more than 300 hours to help out with little pieces of the design, but I ended up working several thousand hours and did the majority of the roadway design segments. It was the most meaningful to me because I learned a lot by getting thrown into the deep end from the very beginning. But it was also fulfilling because it was in construction for the past couple of years, and when it opened, I was able to ride on that light rail with my 3-year-old son and see his excitement and joy as we arrived past roads that Dada designed. We’d go past a road, and I’d say, “Hey, Josiah, I designed that road.” Then we passed by some trees, and he said, “Dada, did you design those trees, too?” It was adorable.